Nothing takes away the winter chill better than a delicious, hot soup! 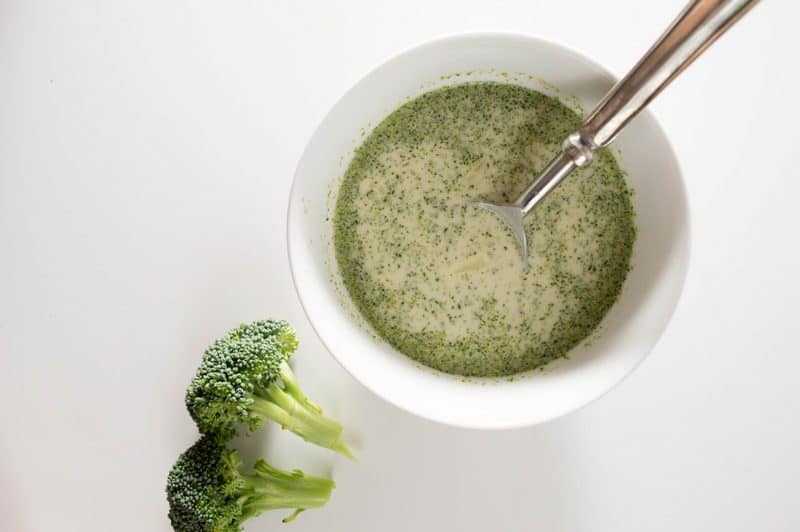 This broccoli cheese soup is the perfect easy, healthy recipe for those cold winter nights. Now that the holidays are over, I am sure that everyone is looking to lose some pounds! What’s better than a hearty broccoli cheese soup to warm you up on the cold winter days and help you achieve your weight goals! If you are a regular reader, you will notice that I love easy, healthy recipes in general and soups in particular! They are so easy to make and are perfect for our Canadian winter days! When temperatures are around minus 25 Celsius, you don’t feel like eating a salad or a sandwich! A soup with homemade garlic bread is perfect for any lunch! I usually accompany them with some spinach beef balls et Voilà! Make sure to print the recipe card and watch the video tutorial. Some people may find broccoli hard to digest (my husband is among them)! But almost anything affects my husband stomach. He is always chewing TUMS or gas relief tablets!! Luckily it is not hard to digest for me, nor the kids! Affiliate links included. Thanks for the support. 2 ½ cup of chicken broth! You can replace it with vegetable stock if you prefer. Add cheese! Leave some for decoration! Add milk and heat! Do not bring to boil! Some people prefer cream: The taste is better with cream, but the calories are higher! You can replace the milk with a low-fat cream, but I couldn’t find any in my area. That’s all it takes to create a delicious, easy healthy recipe that will warm you up on a cold winter’s night. Doesn’t it look so rich and creamy? Some recipes call for salt and pepper, but I find that the stocks contain enough salt and pepper! Besides, I add enough cheese to cover for my salt needs! I have always watched my salt intake as my family has a history of cholesterol problems! What is your favorite easy, healthy recipe for those cold winter nights? Have you ever tried Broccoli Cheese Soup? Now you got me so in the mood for soup. That sounds great. I love broccoli soup. I need to make it soon. I will have to try this version. I haven’t made my own broccoli cheese soup in forever. This looks so good! Sounds like a good way to warm up on one of these cold winter days. Great that it is simple to make! Wow, this is simple and a great way to get kids to eat their veggies. Thanks for stopping by and Pinning! This looks so delicious and easy to make! Definitely pinning–maybe I’ll try it out this week! I’m hopping over from Think Pink Saturday. I love that I have all of the ingredients for this! Most broccoli cheese recipes call for weird things I don’t usually have on hand. Thanks for sharing! Wow. Two of our favourite foods. Delicious. My kids would love this. Thank you so much for sharing your delicious Broccoli Cheese Soup with us at Full Plate Thursday, we will really enjoy this soup. Have a great weekend! My daughter has just begun to love broccoli, so this would be a great recipe for her. She would love it! I am sure she will! Thus recipe is so simple and easy, yet sounds delicious! My family loves broccoli cheese soup and now I can make some quickly! I can’t wait to try this! I love broccoli soup and what I like best about this recipe is the small amount of cheese used. Even thou I live in Florida we still enjoy soup every now and then. Especially on cool rainy days like today. I agree, I enjoy soups during my spring days and rainy ones! It’s so hearty! Sometimes a cold day just calls for a great cheesy broccoli soup! This recipe looks fantastic. Especially with it being a healthier version of many others I have seen lately. Thanks Amber! I try to eat healthier! Oh yum! I love Broccoli Cheese Soup. Thank you for sharing a Gluten Free Version!